Romantic art is characterized both by its unique brushwork and its subject matter. Romantic paintings frequently depict the struggle of man and nature, or man against himself. As a reaction to the Enlightenment movement, Romantic artwork was darker and featured Gothic elements. The colors, often dark, were carefully chosen to convey mood and expression. Romanticism was born as a reaction to the aristocratic Age of Enlightenment and, to a lesser extent, the Industrial Revolution. In addition to art, Romanticism embodied literature, philosophy and music. Romantics sought to encompass strong emotion and scenes of nature to escape the pressing realities of urbanization and industrialization. 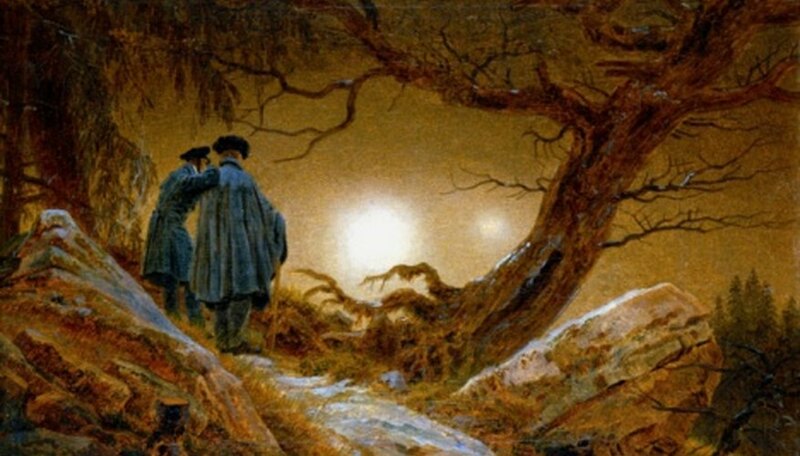 Romanticism was almost the opposite of Enlightenment, focusing on nature and imagination over science and reason. Impasto is a painting technique occasionally used by Naturalists and Romantic-era painters. Paint is thickly layered onto a canvas, often with visible brush or knife strokes. Different colors are applied without allowing the layers to dry, creating a heavily-textured look. Impasto is used to add the artist's emotion to the painting. Heavy brushstrokes convey anger or high emotion. Impasto is also used to carefully manage light and background foliage. Romantic artists fashioned themselves as neoclassical painters. Unlike their Impressionist successors, the Romantics paid close attention to detail. The scenes were always realistic, and the human figures conveyed distinct emotion and expressions. Bold brush strokes were used for skies and landscapes. However, tight and precise lines were used for human figures and objects in the foreground. Romantics used color as the primary method to convey emotion, not reckless brush strokes or sloppy figures. Color is one of the most important and defining characteristics of Romantic art. As the primary means to convey emotion, Romantic artists used bold colors and sharp contrasts. In many Romantic paintings, the skies are dark or cloudy. The background is almost always black or darkly shadowed. Black and gray skies express a fear of the unknown or some sort of looming danger. Red was commonly used for sunsets or in clothing.